To mark International Day of the World’s Indigenous Peoples – which took place on the 9th August – we are today highlighting the Survival International collection of research papers on resettlement and villagisation in Ethiopia which are available at SOAS Archives. Survival International is a global human rights non-governmental organisation (NGO) which campaigns for the protection of the rights of tribal, indigenous, and uncontacted peoples across the world. The policies of resettlement and villagisation were officially part of the Ethiopian ruling military junta’s national program to combat the devastating drought and famine affecting the country. The resettlement programme was initiated in 1984 by the state’s Relief and Rehabilitation Commission, and it aimed to relocate over 1.5 million people in response to the humanitarian crisis in northern parts of the country. Between 1984 and 1988 an estimated 600,000 people were internally relocated within the country, largely moving from the Northern to the South-West provinces. The official aim of the programme was to increase food productivity by intensifying agriculture in more fertile arable areas of the country. Those communities relocated where often settled in new planned villages on land the government claimed was uninhabited and unused. In 1986, Survival published a critical assessment of the policy of resettlement. Ethiopia’s Bitter Medicine: Settling For Disaster claimed that some communities were being forcibly relocated against their will, families were being violently separated, and that tens of thousands had died due to the conditions of the journey and the poor facilities in the new villages. In particular, Survival highlighted the experiences of the existing indigenous peoples in the South Western regions selected for resettlement, including the Oromo and Anuak peoples, whose traditional land rights and way of life were threatened by appropriation of land by the government for resettlement. Survival questioned the official objectives of the policy, arguing that resettlement in part appeared to be aimed at undermining support for rebel movements around the country, either by depopulating areas of conflict in the North, such as Tigray, or by changing the demographics of regions experiencing unrest in the South, including Oromia. An update, Ethiopia: More Light on Resettlement, published by Survival in 1991, restated the NGO’s case, with further evidence, that resettlement had dramatically impacted on the lives of indigenous peoples in areas chosen for settlement. The Ethiopian government’s related policy of ‘villagisation’ – the grouping of the rural population previously living in separate homesteads into centralised planned settlements – began in 1985. The long-term goal of the policy was the movement of around 33 million rural peoples into villagised settlements by 1994. Its stated aim was to improve agricultural production through mechanisation and planning and facilitate the delivery of social services to rural populations. The programmes conducted under the direction of the National Villagization Coordinating Committee of the Ethiopian Ministry of Agriculture and begin on a large scale in 1985. The policy became a nationwide campaign in 1987 which lasted until it was revoked following the introduction of a more liberal economic policy in 1990. By late 1989 about 13 million peasants had been villagised. 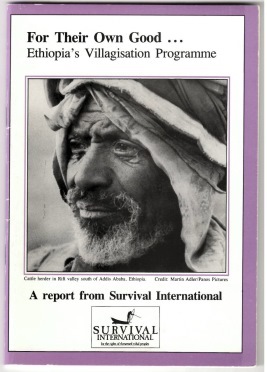 In response to the Ethiopian government’s villagisation policy, Survival published For Their Own Good…Ethiopia’s Villagisation Programme in 1988. The report drew upon Luling’s field work in the region. It claimed that a key aim of the villagisation programme was to extend central government control over the rural population, in particular in border zones such as Oromia where villagisation formed part of wider counter-insurgency policy and had involved widespread human rights abuses. In government controlled areas, Survival claimed that villagisation formed a prelude to the forced collectivisation of farming. The report concluded that villagisation was being imposed in a top-down manner, without regard to the political, social, and cultural rights of the rural population and was leading to the destruction of traditional cultures and social systems, in particular those of Ethiopia’s indigenous, minority peoples in the South West provinces. Survival International’s papers on resettlement and villagisation in Ethiopia are made available to the public here at SOAS Archives. SOAS Library collects and preserves the archival records of British-based pressure groups and nongovernmental organisations (NGOs) who work or campaign on issues relating to the Global South. The archive collection comprises a broad range of research material produced and collected by Survival International in preparation for the publication of the investigative reports Ethiopia’s Bitter Medicine: Settling for Disaster; For Their Own Good…Ethiopia’s Villagisation Programme; and Ethiopia: More Light on Resettlement. This material includes minutes of meetings of NGOs concerning resettlement; correspondence regarding the programmes between Survival and other organisations; field notes taken in Ethiopia and neighbouring countries; and a wide-range of published material produced by the government of Ethiopia, non-governmental organisations (NGOs), United Nations institutions, academics and rebel groups. The papers will be of interest to many members of the research community, including students and researchers in East African studies, development studies, indigenous studies, food studies, and refugee studies. 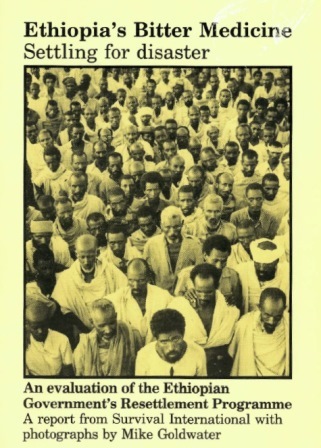 The archive contains a valuable collection of primary and secondary sources concerning the humanitarian and cultural consequences of the policies of resettlement and villagisation for both those forced to migrate and the indigenous peoples of Ethiopia, as well as the international reaction to the programmes in Britain and elsewhere.